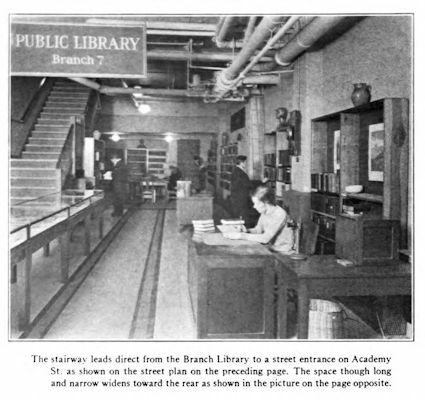 The Central Branch of the Newark Public Library is located in the basement of L. Bamberger & Co. and was opened in November, 1928. It occupies an oblong space 65 feet long. No rent is charged and the light, heat and telephone service are furnished by L. Bamberger & Co. Two tapestries are on the walls in addition to a large picture, numerous vases and small pieces of statuary lent by the NEwark Museum, and a rug furnished by L. Bamberger & Co. help to make a library setting in this corner of the store.